Ergebnisse dieser 'Kohlekommission' weitreichende Bedeutung haben werden. This summer, the climate question has reached everyone: absurd droughts not just somewhere in this world but also in Germany, warnings about tilting effects and global warming around deadly 5°C and then the clearing of the Hambacher Forest by force. All of these are already effects of the climate change. They give us an idea of what is awaiting for us in the future. We refuse to wait and be cynical about it though! Climate change is not fate – climate change was and still is caused by humans. The best example is the power generation from lignite: even though it is the most climate-damaging way to generate energy, even though there is the biggest CO2-ressource of Europe in Rheinland, even though a quick brown coal phase-out is not only appropriate, but even more so it could be done profitable, the brown coal champion Germany still hesitates. Meanwhile, our planet keeps heating up and our natural heritage is damaged irreversibly. But what is also man-made is protest and alternatives. Let it be the persistent and heroic protest at the Hambacher Forest for years, or the growing initiative of Tübingen: Wherever people find together on a local base in order to counter climate change or the logic of profit, they also do so in the awareness that those are global problems. It is especially devastating that the climate crisis primarily affects those who have contributed least of all. In the countries of the Global South the weather extremes as consequences of the climate change are especially strong and are forcing people into poverty and migration. Global injustice is on the one hand partly a reason of man-made climate change and on the other hand, it becomes increasingly critical because of climate change. Solely for that reason, our political interference which goes beyond the criticism of consumption is urgent! In Germany, the “Commission for growth, structural change and employment” is currently meeting. This Commission, also called the Coal-Commission, is supposed to work out a plan for the brown coal phase-out in Germany. Besides its paradox name there are additional flaws: it is mostly economic representatives who are negotiating with politicians. And even though there are environmentalist – those, who bear the main consequences, for example because they belong to the poorer part of the world’s population, are not sitting at the table. But there is the danger that the results of this so-called Coal-Commission will be of far-reaching significance. We only see one solution: the right answer to this closed, defective, but possibly important committee has to be transparency, interference and publicity. It needs us! It now has to be our common goal to increase and maintain the pressure from society in order to politically force the brown coal phase-out. The time of concessions to the profit interests of the individual corporations must come to an end! The right decisions which enable all human beings on this planet to look into a bright future have to be made right now! For that reason, people all of over the country will take to the streets, the forests, the coal mines. 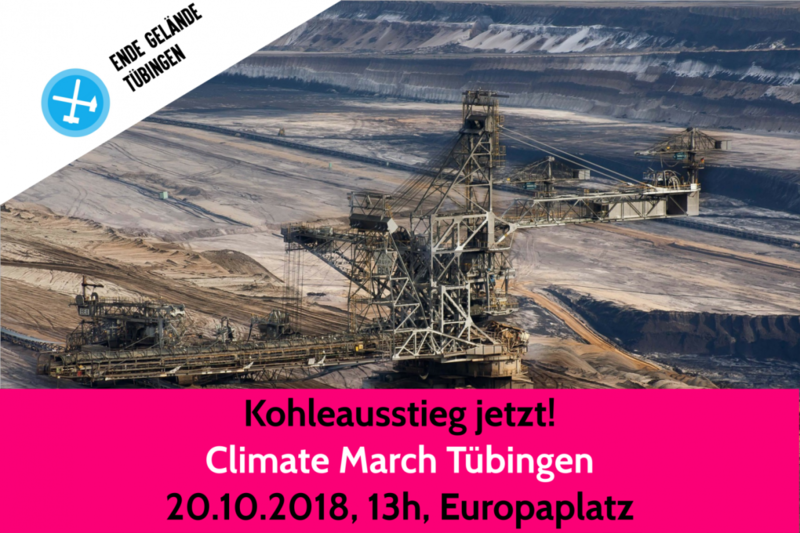 In Tübingen, we are joining the climate movement and will demonstrate together on the 20th of October at 1:00 pm for a quick brown coal phase-out and a climate-friendly world. With you? Share our call, become a supporter (for more information check climatemarchtübingen.wordpress.com) and of course join us with your friends at the “Europaplatz” (near the train station)! We demand an immediate brown coal phase-out. It is possible and necessary! We show solidarity with the occupiers in the Hambacher Forest. We understand your fight, it is ours, too! We stand up for global climate justice and energy democracy. This is a world, in which we would like to live!